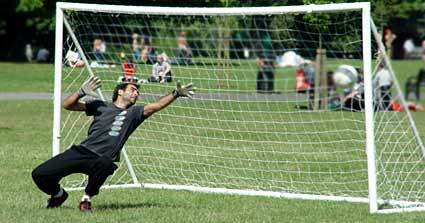 Based in Clissold Park, north London, this annual seven-a-side competition started life in 1997 as The Looney Left Cup. 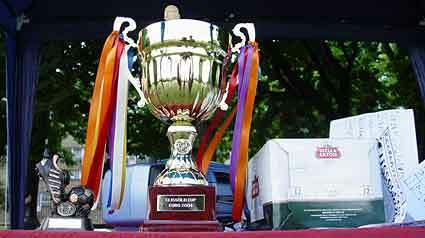 Several competitions are held every year, each one promising an afternoon of fun, friendship and a good footie match. This year saw the first entry of an urban75 seven-a-side team, hand picked from a ragtag of contributors to the popular bulletin board, duly whipped into shape by their ruthless taskmaster, Rollem. The glistening cup. Sadly, this was as close as the urban75 team would get to it this year. But the word from the coach is that there's a leaner, meaner, fitter goal-scoring machine training hard and ready to start giving 110% on the pitch! Action from the International V Recreativo semi-final. The semi-final was decided on penalties. This one went in for Recreativo! The goalie is unable to halt the final penalty kick going in the onion bag, so it was early doors for Recreativo and a place in the final for International. The Strollers overcame International 1-0 in the final and here they triumphantly parade their trophy before getting stuck into the prize champagne and Stella. 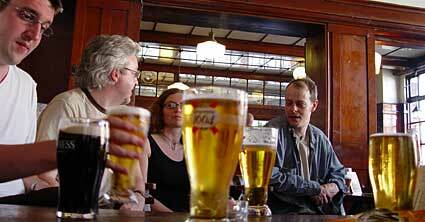 For the urban75 team and supporters, it was down to the pub for post match analysis. And lager. Lots of it. Particular thanks go URBAN 75 who's enthusiasm for the tournament on their bulletin boards was a joy to read. They went home with one point, and one goal but were great sports and a great bunch of people.